One of the benefits of the seemingly endless Republican primaries, aside from the entertainment value, is the opportunity to discover how right the candidates are … about each other. With the Iowa primary and its game-changing outcome behind them, and even-higher-stakes in the New Hampshire and South Carolina primaries ahead of them, the remaining candidates have intensified their attacks on one another. What’s more striking than the intensity of the candidates’ obligatory attacks, however, is the accuracy of their worst accusations against one another. The most recent, and perhaps most striking example, is Newt Gingrich’s latest attack on Mitt Romney. When Newt stomped out of Iowa, complaining bitterly about being done in the same kinds of attacks he practically invented, he wasn’t retreating to New Hampshire to lick his wounds. He went to reload, and this week Newt turned both barrels on Mitt Romney. Thanks to a $5 million donation from a wealthy casino owner, a group supporting Newt Gingrich plans to place advertisements in South Carolina this week attacking Mitt Romney as a predatory capitalist who destroyed jobs and communities, a full-scale Republican assault on Mr. Romney’s business background. The advertisements, a counterpunch to a campaign waged against Mr. Gingrich by a group backing Mr. Romney, will be built on excerpts from a scathing movie about Bain Capital, the private equity firm Mr. Romney once ran. The movie, financed by a Republican operative opposed to Mr. Romney, includes emotional interviews with people who lost jobs at companies that Bain bought and later sold. …The Bain-centered campaign strikes at the heart of Mr. Romney’s argument for his qualifications as president — that as a successful executive in the private sector, he learned how to create jobs — and advances an argument that President Obama’s re-election campaign has signaled it will employ aggressively against Mr. Romney. That’s just the three minute trailer. I haven’t seen the whole 27 minutes. But, if the trailer is any indication, this might be one of those rare moments when Newt gets it right. Medicare was one. So was the “Super Committee.” The payroll tax was one. Bain Capital is another. The only thing missing from the trailer is an appearance by Gordon Gekko — the character from Oliver Stone’s Wall Street, who made Michael Douglas and Oscar Winner, and embodied the the worst of the 80s materialism and Reagan-era deregulation. Not that a Gekko cameo is necessary. 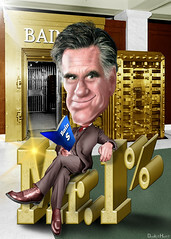 As Paul Krugman pointed out, in Romney the GOP already has its own Gordon Gekko. Only this one isn’t headed to “Big House”, like his silver screen counterpart. This Gekko is aiming to move into the White House. Of course, Newt’s not the first to notice the striking resemblance between the two. Americans United for Change launched its Romney-Gekko 2012 campaign last month. This is the kind of stuff that makes Randroids tea partiers misty-eyed with admiration. But it doesn’t jibe with the rhetoric about “job creators” on the right, or with Romney’s repeated claims that he was a “job creator” while at Bain Capital. By definition, the kind of “venture capitalism” Romney practiced at Bain involves lost jobs, because it’s all about keeping investors happy with high returns, not keeping people on the payroll. A former managing partner at Bain, in an interview with the Los Angeles Times, made it clear that job creation was never the point at Bain. Under Romney’s leadership, Bain certainly created wealth for its investors, no matter what happened to the companies it acquired or the the people worked for them. The Wall Street Journal’s revealing look at Romney’s time at Bain shows that 22% of the companies Bain invested on under Romney’s watch either filed for bankruptcy, reorganized, or closed their doors — sometimes with substantial job losses. As Pat Garofalo pointed out, that’s nearly one fourth of the companies Bain invested in. The LA Times piece makes it clear that Bain and its investors profited, no matter what happened to the companies in its portfolio. According to the Wall Street Journal, 70% of Bain’s returns came from just 10 deals. The LA Times article notes that “Four of the 10 companies Bain acquired declared bankruptcy within a few years, shedding thousands of jobs.” Still, Bain profited in eight of those ten deals, including three of the four that went bankrupt. That’s the way “vulture capitalism” (as I like to call it) works. Bain and its shareholders profited in the end, no matter what else happened. That’s the part of the story that the Gingrich movie seems to tell: what else happened. We know what happened on Wall Street when Mitt Romney came to town. A few people — Mitt Romney included — made a lot of money. Now we know what else happened on Main Street when Mitt Romney came to town. It’s the story of what happened to companies like Dade International. But an examination of the Dade deal, which Mr. Romney approved and presided over, shows the unintended human costs and messy financial consequences behind the brand of capitalism that he practiced for 15 years. It’s the story of what happened to GS Industries, from the LA Times article. It’s the story of working people like Randy Johnson. Randy Johnson said Sunday that the former Massachusetts governor’s decisions as Bain’s CEO put him out of work. Romney was the chief executive officer of Bain Capital in 1992 when the company purchased American Pad & Paper, or Ampad, and oversaw the management of that company and others. Ampad went bankrupt in 2000, and investors netted over $100 million from the deal, according to the Boston Globe. Johnson and others from the Indiana paper plant where he worked traveled to Massachusetts during Romney’s Senate race against Democratic incumbent Ted Kennedy to express their concerns over not getting a fair shake from the new management. A few months later the plant was shut down. Johnson received a personal letter from Romney on the day the plant closed expressing his condolences about the turn of events. About 200 workers lost their jobs, and it didn’t have to be that way, said Johnson, who was told the plant was still making a profit when it was sold to Bain Capital initially. It’s the story of working people like Donny Box. But Johnson isn’t the only one. MoveOn.org released a new ad this morning featuring steel worker and Army veteran Donny Box, who lost his job of 32 years at Kansas City’s GST after Romney’s firm took it over. The spot will run in New Hampshire starting tomorrow and running through Tuesday’s Republican presidential primary. These stories will probably resonate with voters in New Hampshire and South Carolina, where Bain cut jobs while executives and their investors profited. They are stories that once were only heard around kitchen tables or between barstools. They are the same stories that have been credited helping to fuel anger that gave rise to both the tea party and the Occupy movement. Americans know these stories, because they are our stories. They are our children’s stories, our neighbors’ stories, and our friends stories. We know them well, and we know the rest of the story just. That’s why Gingrich is happy to co-opt these stories and broadcast them far and wide. Newt doesn’t have a real plan to create jobs any more than Romney, or the GOP’s other presidential wannabes. But he can still make Bain the bane of Romney’s campaign. It’s so easy, even Rick Perry can do it. It’s effective. I can almost picture millions of Americans nodding in agreement with the simple truth Newt stated during the Republican debate in New Hampshire. When Mr. Gingrich accused Mr. Romney at a debate on Saturday in New Hampshire of following a “Wall Street model” where “you can basically take out all the money, leaving behind the workers,” Mr. Romney retorted that he had helped create 100,000 jobs, citing successes like Staples. Given the probability that Romney will be the Republican nominee and Newt won’t, Gingrich probably doesn’t much care that he’s given President Obama a great line of attack against Romney. After all, even in the midst of an economic downturn, President Obama can at least take credit for having a hand in adding more than 1.4 million jobs to the economy, compared to Romney’s shaky claim of creating 100,000 jobs while at the helm of Bain. For that matter, Obama can claim to have helped create more jobs in Massachusetts than Romney did during his term as governor — 64,000 green jobs in two years, compared to 45,800 during Romney’s four years as governor. I can definitely picture millions of Americans nodding in agreement with that simple truth.